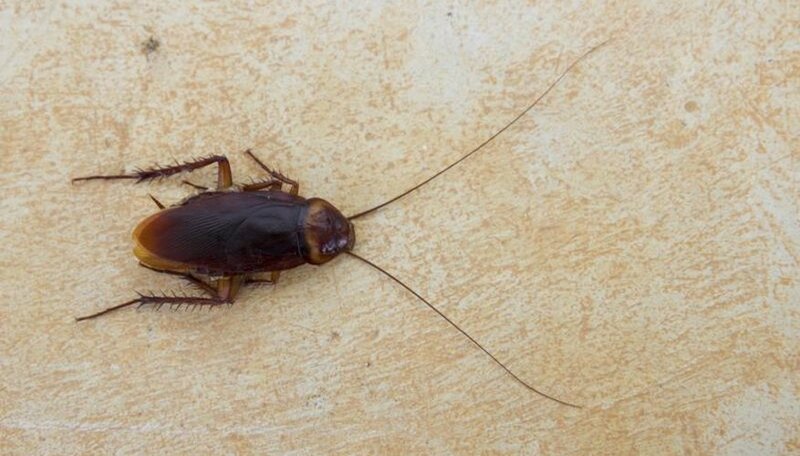 Cockroach is the common name given to thousands of species of insect in the order Blattodea. Of the approximately 4,500 cockroach species, only about two dozen species are considered to be pests, and of those, only a few live in the United States. Oriental and wood cockroaches can establish themselves in your garden, where they sometimes infest mulch or damp areas. From there, they can easily move into your house. Despite its name, the American cockroach is not native to the U.S.; it was likely introduced from Africa. It is now a common pest in the United States, however. Adults are reddish brown and about 1 to 1 1/2 inches long. The top of the roach's head is typically cream colored with darker markings. American cockroaches like warm, moist places, so they tend to infest indoor areas where conditions are consistently above 82 degrees and damp. In warm southern climates, where the species is sometimes called a palmetto bug, it may live in the garden in wood piles or damp mulch. The German cockroach is considerably smaller than the American cockroach; adults are only about 1/2 inch long. They are light brown with two dark bands behind their heads, running from their eyes toward their rear ends. German cockroaches are much more likely to be indoor pests than to infest gardens; they are commonly found in kitchens and bathrooms, where they lurk around plumbing fixtures and in cabinets and drawers. Like the American cockroach, the German cockroach likes warm, moist locations, but it prefers temperatures between 70 and 75 degrees. The Oriental cockroach is about the same size as the American cockroach, approximately 1 to 1 1/4 inches long, but it is dark brown to nearly black in color. This species handles cool temperatures better than some other cockroaches, and it can live outdoors quite happily, even in northern climates. Oriental cockroaches feed on organic matter and often infest outdoor and garden areas near buildings. When they're established near structures, they may migrate indoors if they're disturbed. Wood cockroaches are smaller than American cockroaches -- about 3/4 to 1 1/4 inches long -- but they are otherwise similar in appearance. Their behavior is markedly different from that of the pest species, however. They will wander openly during the day and will usually not skitter away when disturbed the way that American cockroaches do. Their preferred habitat is outdoors in rotting logs, in wood piles or under loose tree bark, and if they come indoors, it's usually by accident because they've wandered in or have been carried in with fire wood. They don't reproduce indoors and will not become established inside the house. Some species of cockroach, such as the Australian or Surinam cockroaches, thrive only in very warm climates and are not a problem outdoors in temperate parts of the United States. However, they are sometimes inadvertently transported in potted plants, and they may be introduced into greenhouses or other indoor locations that are sufficiently warm and humid to keep them alive and well.